The language, the characters, and the sheer joy of The Wind in the Willows is the kind of book that inspires young people to read, to write, to value friendship, to love nature, and to want to know more. Four little animals—the shy Mole, Rat, who loves the river, Badger who doesn't go out much, and Toad, whose boisterous adventures can have dangerous consequences—stand up to bullies, rescue a baby otter, and learn how to listen to what the wind whispers in the willows, all along the river. In our production, the characters appear in many ways: as large puppets, hand puppets, masks, shadows, acted by humans, and on film. We like to keep the audience guessing, with small telling details and changes of perspective that stir the imagination. Russell Levia's live music, played on banjo, harmonica, accordion, zither and hornpipe, uses themes from many composers, from Percy Grainger and Vaughan Williams to Beethoven. Mole cleans his house, emerges into the sunshine and, to his great delight, meets Rat. The two have a wonderful picnic but on the way home, over-enthused Mole capsizes the boat. Rat graciously invites Mole to stay and live with him. Mole and Rat visit Toad of Toad Hall who is generous but tends to be conceited and obsessive. He takes them on a trip in his horse drawn caravan but when it is driven off the road into a ditch by a motor car, Toad has found a new craze: cars. Hoping to meet Badger, Mole ventures into the Wild Wood, where he is frightened by shadowy creatures and takes refuge in a the hollow tree. By the time Rat finds him, it is snowing and the two are lost in a snowstorm until they stumble on the welcome mat of Badger's house. Mole and Rat enjoy Mr. Badger's warm hospitality. The three of them decide to take Toad in hand come spring. Badger, Rat and Mole move in with Toad to try to cure his now dangerous addiction to motor-cars but Toad escapes their vigilance through an upstairs window. He steals a car, drives recklessly, insults a police officer, and is sentenced to twenty years in jail. 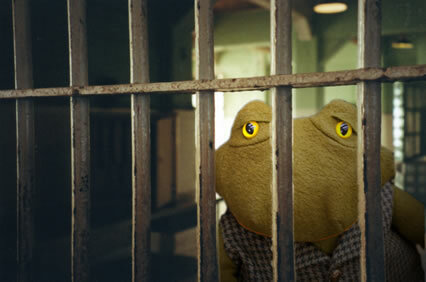 Toad, befriended by the jailor's daughter, dresses as a washerwoman to escape from jail. He hops a train to escape his pursuers, jumps off at an unknown wood, and shelters in a hollow tree. When Otter's young son is missing, Rat and Mole row out looking for him. They hear a mysterious piping sound that draws them to an island where they catch a glimpse of Pan, the Friend and Helper, cradling the baby Otter. In Toad's absence, Stoats and Weasels have moved into Toad Hall. When Toad returns, Badger, Mole and Rat hatch a plan to get it back. Mole spreads rumours among the Stoats that Toad has returned with a huge army. When the four friends storm the dining hall through a secret passageway, their sudden entrance causes such terror and confusion that the interlopers are easily defeated. Toad renounces motor cars and sends gifts and letters of apology to all those he has wronged. Everyone settles back into peaceful lives.